Yesterday, I had a ricotta emergency and, naturally, tweeted it. Tomas had bought way more ricotta for the Lazagna I’d made a few days earlier and I knew it was doomed to curdle if I didn’t take action quickly. My Tweeps and Facebook pals came out en force with some wonderful suggestions. I opted for the one I had all the ingredients on hand for, and which I could easily recruit a kiddo or two to help prepare. @VetrinaGirl suggested: Mix it with honey and walnuts. #heaven OR Mix it with lemon yogurt. Yum! 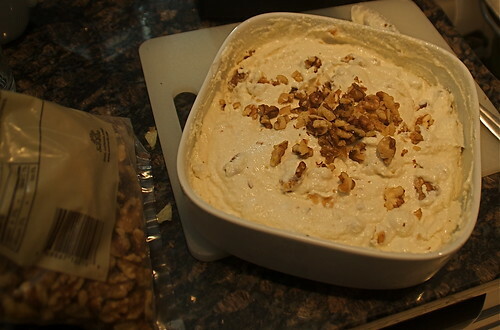 What I did: Mixed the ricotta with maple syrup and chrumbled walnuts. Added the syrup to Maggie’s taste which was way sweeter than to my taste. @FuzzySheep: Tyler’s Gnocchi w/ Peas, Prosciutto and Ricotta. http://trunc.it/3fu3k So fresh, easy and VERY yummy! @Stacerella: Ricotta cheese cake. I make them in small springform pans or in a tort pan if I have 1/3-1/2 of the ingredient volume onhand. Ursula: I got it!! I made a pumpkin cheese cake the other day for a pie contest .. it was delish… made fluffy with Ricotta! All of these sound wonderful, don’t they?